Hello there. I’m Leslie. I love pen and ink drawings, pickles, and hip-hop. Most notably, I am one-half of a phenomenal farming duo, along with my partner Liberty Hunter, and one-third of a stellar farming partnership at The Salad Garden in Ashland, Missouri. I grew up in Columbia, a lovely little suburban college town right smack in the middle of the middle state of Missouri. I wasn’t born with farming in my blood. I went to college, earned a degree in Art History, and then, like many new graduates, I found myself at an impasse. I didn’t begin farming because I was disillusioned with the state of agriculture or disappointed by food systems or environmental depletion (although I quickly became so). I started farming because I loved food and I had grown weary of being indoors. Like many young people not raised in a farming family, I figured farming was something simple and beautiful, an idyllic occupation where you reap what you sow, work hard but not too hard and at the end of the day, you can sit back with a beer and watch the sunset. Some of my initial naïve perceptions of farming are true: it is beautiful and I do get to watch the sunset sometimes, though it is often while leaning over a hoe or a tote full of just-picked veggies. I quickly learned to love the labor and love the gratification of seeing tiny seeds grow to fruition under my watch. 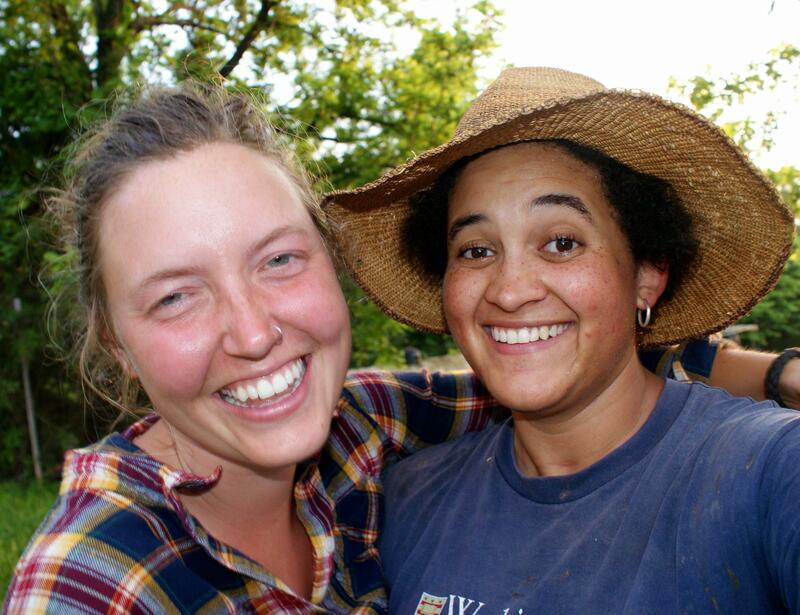 Liberty and I meet while interning at the Kansas City Center for Urban Agriculture (now called Cultivate Kansas City) and our relationship grew parallel to our relationship with sustainable agriculture. Liberty is from Kansas City and she grew up gardening with her mother in her expansive, sunny backyard. Farming was never a blip on her radar until she was in college and a nutrition class sparked an epiphany in her about the value of fresh food. Already armed with a fierce work ethic, she started a community garden in her hometown and spent a winter month WWOOF-ing on a goat farm in Colorado. 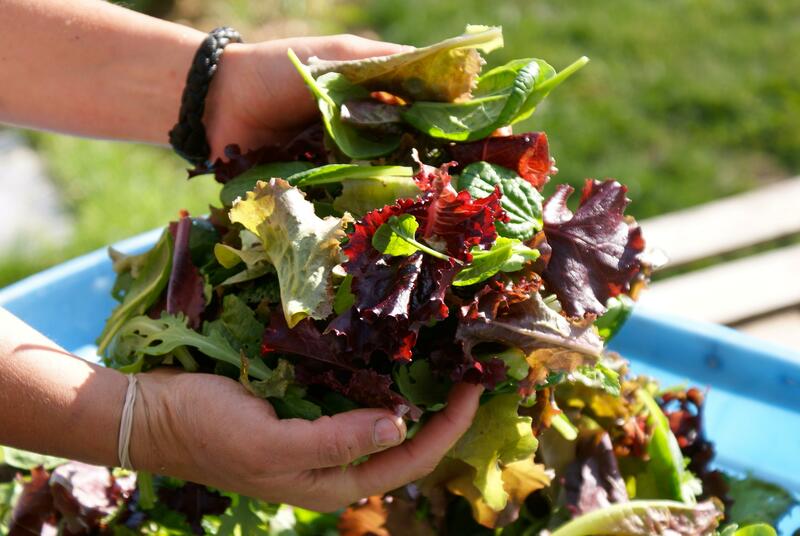 In 2011, we began a partnership with Dan Kuebler, owner of The Salad Garden in Ashland, Missouri. Dan was in the market for some young, experienced farmers to take on the operations of his farm. It just so happened that we were looking to get out of the intern circuit and break out on our own—we just needed the money and the land to do it. The three of us formed a unique partnership: Dan provides the land, the equipment and the infrastructure for our use; Liberty and I fully operate the farm, from marketing to planning to planting; the three of us co-own the business and divide the profits. The Salad Garden is about 30 acres of woodland, structures and tillable ground. The two main growing areas are hilltops, separated by a woody ravine. The hilltop to the south is a little over an acre and it is our main growing area. Due to the contours of the hills and the various runoff locations, it is divided into several small plots, a tactic I would not recommend for growing a diversity of vegetables. Each of our plots is a different length and width, making winter planning and crop layout a veritable mathematical word problem. The north field, once an unkempt pasture, is now a lush stand of clover and rye and we hope to utilize the field in 2013. Most of our tillage and bed shaping is done with a BCS 853 walk-behind tractor but we also have a small Kubota tractor for disking, mowing and plowing. Most everything else, from seeding to weeding, is done by hand or with the help of human-powered mechanisms like our beloved Jang Seeder. We make our money in the organic vegetable trade, which is not a particularly stable prospect. Our primary focus is on raising, distributing and eating over 200 varieties of certified organic produce ranging from old standards to the more unusual. In our spare time, we grow shiitake mushrooms and tap sugar maples for syrup in the winter. We also keep small flocks of both heritage laying hens and ducks. 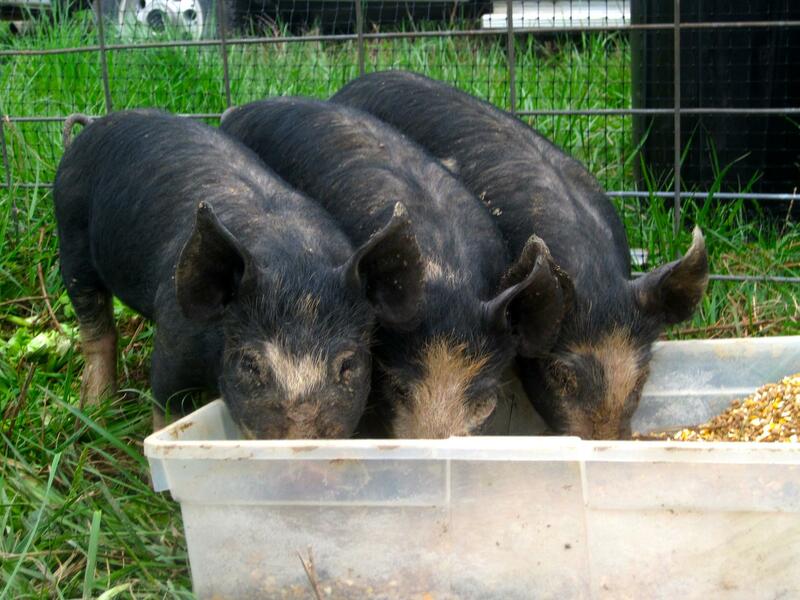 This season, we are raising five Berkshire hogs that we will slaughter and butcher on the farm at the end of the season. 2011 was our inaugural year as full-time farm owners. Our first year managing The Salad Garden was full of new experiences: buying thousands of dollars in supplies and seeds, operating a BCS “tractor”, seeing our names on a restaurant menu, dealing with and paying taxes, etc. We’ve managed to build solid relationships with our lovely customers, chefs, university folks, other fellow farmers, and grow a few really perfect veggies along the way. Now in our second year of operating our very own farm, we hope to ramp up production, fix our mistakes from the season before, keep our new CSA members happy and fed, continue to learn about our land and soils, and make sure our own relationship with each other is still fun and sane. I can already smell the triumphs and the turmoils that will define this second season. Follow along with us as we attempt to make our second farming season just as successful as the first!